This coming Saturday, beer fans across Madison will be disembarking from whatever safe transport took them home from Olin Park, livers busily processing the fruits of the Great Taste of the Midwest's bounty to varying degrees of success. And shortly thereafter, beer fans hailing from points beyond Wisconsin's borders will have their trunks full of New Glarus, O'so, MobCraft, and a handful of other beers not (or not yet) widely available outside the Badger State, speeding away with their new treasures. Last year, pre-GTMW week witnessed a veritable plague of beery locusts, the shelves relatively full of New Glarus Wild Sour -- easily last year's most impressive Wisconsin release -- and damn near scrubbed clean by the time the dust settled on Monday after the Taste. The air was thick with the plaintive cries of those who waited a week too long to pick up a four pack. 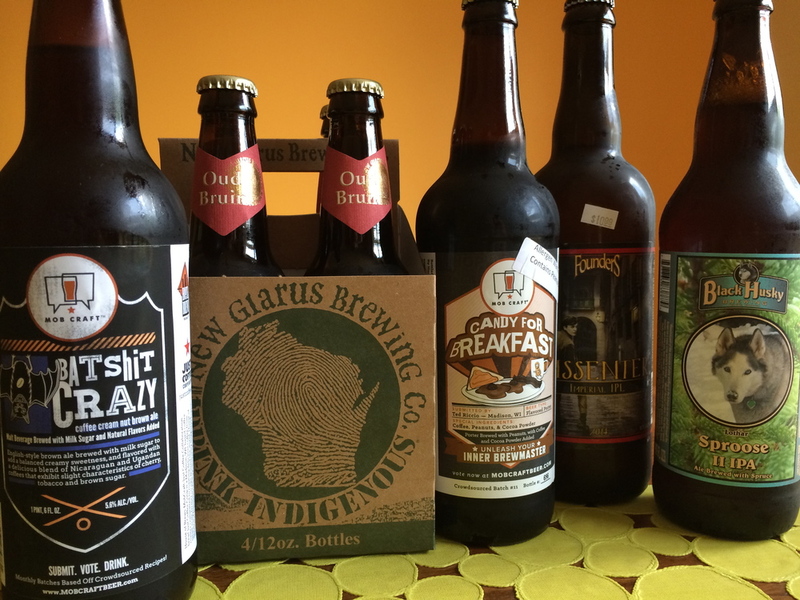 Some of the beers of Wisconsin you should be shopping for this week, plus one interloper. Really, anything that's on shelves from tiny, self-distributed Black Husky will probably be an endangered species post-GTMW. But the piney, hoppy beauty that is Sproose (formerly known as Sproose Joose) is a Wisconsin superstar that wise shoppers will snap up while it's here. While this is a Wisconsin-centric post, a few moderately chase-ish beers from outside of Wisconsin deserve mention. Founders Dissenter Imperial India Pale Lager is a Backstage beer that's relatively cheap and plentiful (compared to previous releases, anyway), and just hit shelves. Similarly, Deschutes Black Butte XXVI is here to celebrate not only the brewery's birthday, but its arrival in the Wisconsin market. And Nebraska Brewing is only distributed in a couple states east of the Mississippi, and Black Betty Russian Imperial Stout is arguably that brewery's tentpole release; it's around...for now. Madison's crowd-sourced brewery is growing in both production scale and public awareness, and there are some festival-ready brews sitting on store shelves this week. Batshit Crazy's second run is near its end, as is Hop Gose the Grapefruit's initial run. Brand new to retail is Candy for Breakfast, a porter with coffee, peanuts, and chocolate, and that's the kind of thing that beer geeks will flock to on a festival weekend. I'm as amazed as anyone that Winds of Change, O'so's Bretty pale ale, has lasted as long as it has, but its luck can't continue to hold. It's been aging well. Convenient Distraction, on the other hand, is running low all over town. This coffee/vanilla variant of Night Train is definitely worth drinking immediately. Restless Soul, formerly known as the tap-only Brett Dank, just recently came out in bottles, and should be plentiful enough to last. But really, why wait?